Let’s accept it. Nobody likes to browse a vacation website that looks so dull and old. If you have got a travel website, it must look exciting. Period. I mean that’s the whole point of that website. Visitors must feel good looking at your website, otherwise there is no way they are going to stay on your website, leave alone use your services or read your blogs. This can definitely hurt your conversion rate. So if you have a travel, hotel or vacation WordPress blog or are making a new one, picking one of these themes will definitely keep you ahead of the competition! 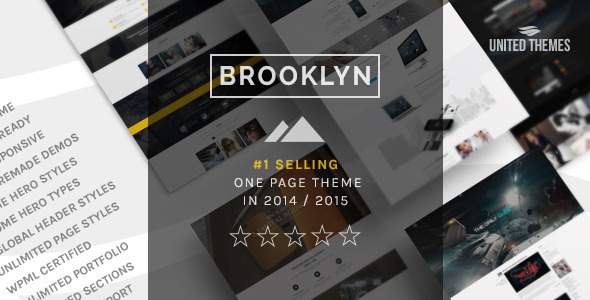 Brooklyn is one of the best looking themes, thanks to the parallax effects. And when coupled with a one page design, you can be sure to mesmerize your visitors. The design is fluid and responsive and fits in easily on any screen size. You can add a portfolio of pictures and can create pricing tables easily. 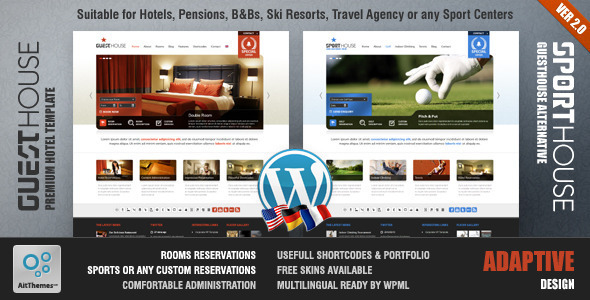 The theme supports WPML and Slider Revolution comes free! You can choose from over 13 predefined demo setups and can setup your choice in just a click. 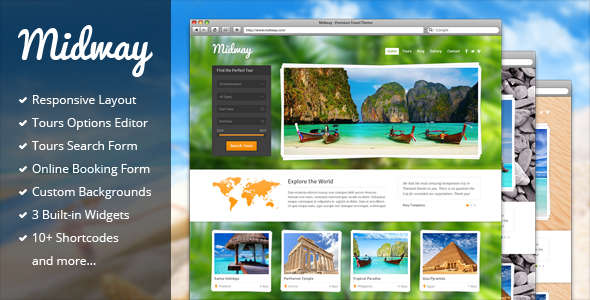 This theme is specially designed for travel companies, but can also be used for other purposes as well. The package post type features enables you to showcase your travel packages easily to the visitors. A pre-made booking form is also included along with a package filter feature. The theme is retina ready and fully responsive and has been coded with the best SEO practices to benefit you in the search engine ranks. Layer slider enhances the beauty while the easy page builder makes customization a child’s play. Woocommerce is supported too. 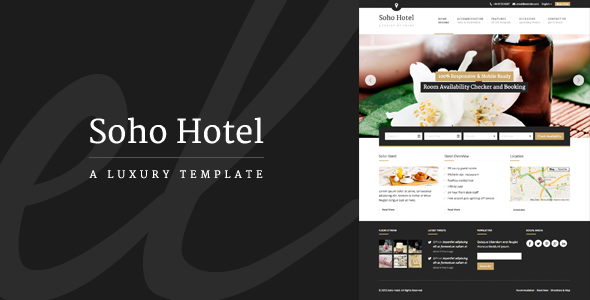 This theme is marketed as ‘a luxury template’, and it does stand true to this tag. The theme looks awesome and modern, while being extremely user-friendly. Choose from 4 great color schemes and 19 PSDs to make your own customizable style. 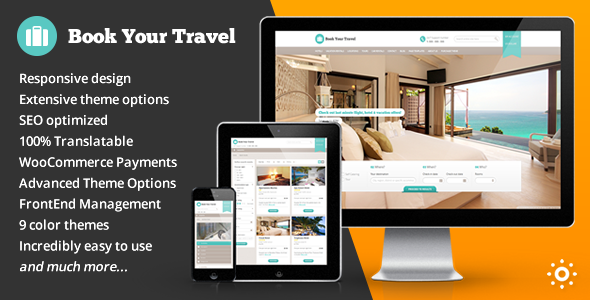 An advanced booking system with availability checker comes integrated with this theme, making it easy for your customers to plan their travel and stay. The theme is translation ready and comes with features like events list and customer testimonials. PayPal payments are supported, so taking deposits is a breeze. Listify is essentially a directory theme, so listing hotels and making reservations therein is very quick and perfect with this theme. This theme matches excellent functionality with great looks, making it a full-on awesome package. Woocommerce, OpenTable, Resurva, and Guestful are already supported if you want a reservations system; this can actually make one of the fastest listing and reservation site. The theme comes with powerful plugin integrations and is made with SEO in mind, so this theme makes for a win-win situation. This WordPress theme is high on capability. 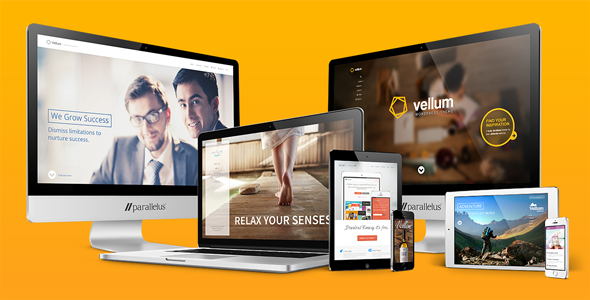 Vellum is totally SEO optimized and fully responsive. It has a unique structure and you can create any style, layout or design out of this single theme. UberMenu lets you create highly functional mega menus with multiple columns, subtitles, titles, icons, etc. Slider Revolution comes included and does wonderful animations for your gallery slideshows. Visual Composer helps you to customize the theme as per your taste with the simple drag & drop mechanism. 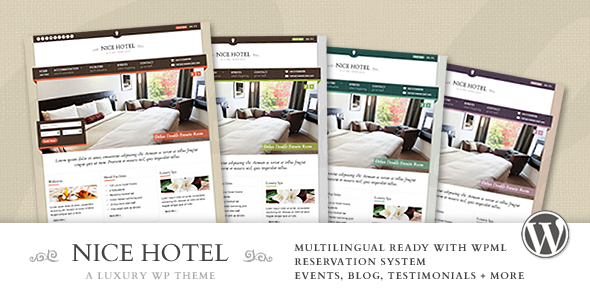 This theme can practically be used for any reservations site, be it hotel or hostel or anything similar. The admin panel is crazy easy and the theme auto-generates a good-looking page for every room, including all the rooms in the slider. A nice order form is included too for the customers to make inquiries. The theme has a clean and simplistic design and supports WPML too. Unlimited color scheme and more than 20 slider effects make this theme simply superb. 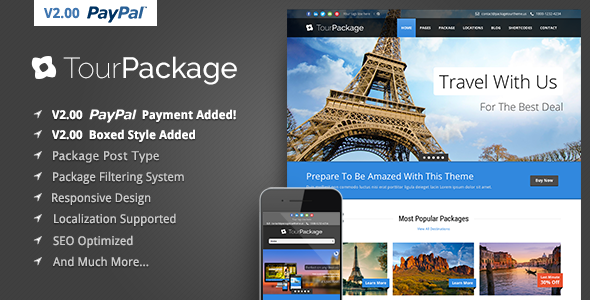 This theme is fully responsive and designed especially for travel operators, tour agencies, and other such services in the tourism category. BookYourTravel supports full translation and gets an integrated powerful booking system. It is coupled with advanced filtering and availability checker to make the experience easier for your customers. There is a review system included too, and in case of partners, front-end management is easy with this theme. Payments are easy with Woocommerce integration and PayPal and many others. Customized widgets and 9 color schemes enhance the customizability further. Have a booking website for hotels, spas, resorts, etc.? Then Nice Hotel is the perfect theme for you. The theme looks absolutely luxurious and a notch above all the other booking site themes. You can easily add images and descriptions for the rooms and services with Accommodation Management while the Booking Wizard makes it easy for the customers to reserve the room of their choice. 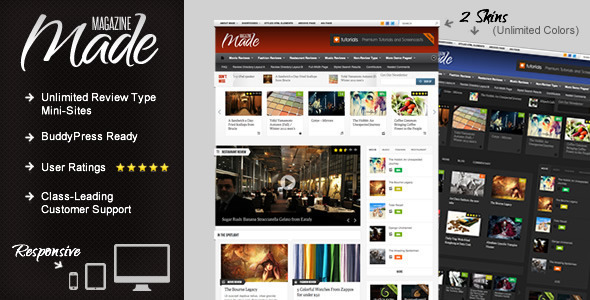 The theme is fully responsive and WPML ready and comes with 4 predefined skins. If you prefer your own style, you can easily customize with the help of color picker. The home page and contact page are easy to configure, and you also get management system for events and testimonials. This theme is specifically made for travel and/or review magazines. 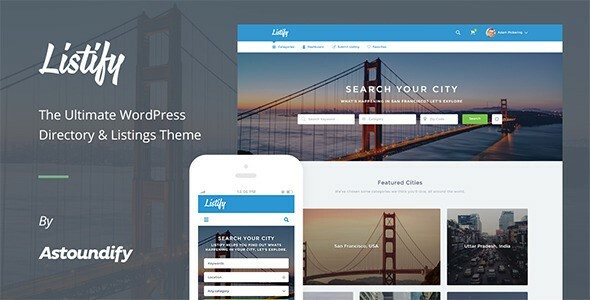 This responsive BuddyPress theme looks elite and is backed by a solid framework. Customizability is a breeze with unlimited color schemes and two predefined unique skins. You can also customize the background to match your content. The rating system is one of the best-in-class with the option of using stars, numbers, letters, or percentages. User ratings feature make your website genuine to the visitors, and a ton of other great features like great sliders and carousels make the theme a perfect investment. Midway suits all types of travel business websites. With ease of use and high level of customizability, it has one of the most powerful theme panels. Searching, booking, and managing tours is a child’s play with this theme. It is really easy to use and customize, comes packed with powerful tools for managing, searching and booking tours, changing styles and more. This theme gets unlimited sidebars and integrated social links along with 4 custom user forms and 2 slider types. Payment system is simple enough too and the integration of Google Analytics make the theme more functional. Born to write. Workaholic. Avid Thinker. Crazy Blogger. And passionate about all of these!